Every time Facebook or any social network makes an update of any kind, it’s almost instantly met with cries from the marketing community. Every update seems another move to kill off social media marketing and bring an end to the world. Facebook just announced a new update to the timeline, and this one is sure to really make many marketers mad. Fear not, these changes aren’t as bad as many think. Here’s why this Facebook update isn’t a bad thing. Facebook just announced a new update to the timeline which will put a greater focus on posts from friends and family, while showing less shares from brands. While this may sound like the end for brands on Facebook, it’s not as bad as it seems. Facebook has always been about connecting people with their friends and family. That’s why the site grew to where it is today. It’s never been about brands. They’ve allowed brands to play a part on the network but it’s never been the focus on the site and never will be. We as marketers need to always remember that. People don’t go to Facebook to see what McDonalds, GAP, or Target is trying to sell them. They go there because they want to connect with those that matter most to them, their friends and family. If people don’t see the things that matter most to them (updates from friends and family) they’ll stop coming to the site and all marketers will be left out in the cold. The changes to the timeline will move to highlight more updates from the friends and family that matter most to Facebook users. So what does that mean for brands? 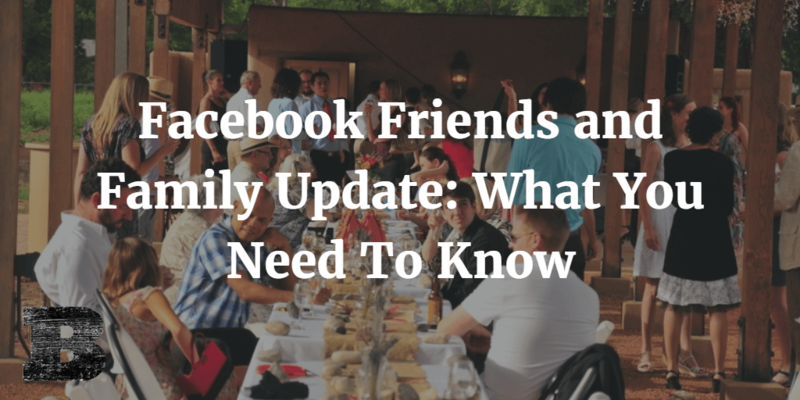 Brands sharing updates on their own pages will likely see a small drop in the impressions from their posts, as Facebook moves to show more updates from friends and family, and less from brand pages. Don’t get your pitchforks yet. This isn’t a bad thing. Sure, the update may mean less viewership of your page posts, but it doesn’t mean you can’t capitalize on how this update will impact what people see in their timelines. While page posts won’t see as much visibility, the content Facebook users share with their community will see more. And that’s where you can score a big win. By creating content that people want to share, marketers can get even more viewership than before. Content shared by Facebook users will be seen by even more of their connections than before. That means if you can get people to share your stuff, it will be seen by even more than it would have previously. In addition to giving you more ability to be seen with share-worthy content, this update may also mean you competitors see less visibility on Facebook. If you can create sharable content while they struggle to figure things out, you have a great opportunity to gain even more visibility with your target audience. The biggest problem here is creating sharable content. This is a spot where many marketers try and fail. Ask most and they’ll tell you how awesome their content is, but take one look and you’re likely to find a ball of boring. Few are willing to admit that they’d never engage with their own content if they hadn’t produced it themselves or didn’t work for their company. We need to really challenge ourselves to make something truly interesting for our audiences if there’s any hope of it being shared with others. If your current content doesn’t see lots of social sharing (outside your own organization) then you’ve got to step back and rethink things. Many may blame Facebook for the failure of their marketing and point to these timeline updates as the reason. This simply isn’t true. The reason most marketing campaigns fail now is the same as it’s always been. They don’t resonate with the target audience and aren’t of interest to them. Creating content your audience wants to share is even more critical now than ever but it’s still something most seem to struggle with. As with each update to social networks, this one may hurt many. But if you search and find the opportunity in each update, not only can you continue to see social success but you can also capitalize on it before the competition. Take advantage of this opportunity and start creating content people really want to share.